An inversion ankle sprain is one of the most common injuries to the ankle and extremely common in the sport of gymnastics. An inversion ankle sprain occurs when the foot rolls inward and the lateral (or outer) ankle muscles and ligaments are stretched beyond their normal limit. Gymnasts are at a particularly high risk of inversion ankle sprains for several reasons. First, they enter into many landings from a skill in the air that requires a toe point (aka plantarflexion). If the landing “comes up short” or they are twisting into the ground, the foot/ankle doesn’t have time to dorsiflex and the force causes the foot to twist in. Second, on take off, a sudden force into plantarflexion is required to propel the gymnast upward. If the lateral ankle muscles aren’t as strong as the medial (aka the inside doesn’t balance the outside), the ankle can roll on the way off the ground. Third, the risk goes up when the landing is on a soft surface (mat) due to the increased requirement of the leg muscles to stabilize the joint. This task involves a significant amount of proprioception/kinesthesia (awareness and neurological control of joints relative to body position). Since the mat is complaint and can give unexpectedly, the gymnast’s ankle must react very quickly and exactly to keep the ankle neutral. This requires a significant amount of practice and often is something that has to be trained with each new skill (we all know that the landing out of a back tuck is very different than that of a front tuck). And finally, the risk goes up if the landing is on an uneven surface (such as half on the mat and half off, or on the edge of the beam). While training, these “imperfect” landings are common and often, that’s when the injury occurs (rather than in competition or while performing). Inversion sprains are categorized by the amount of damage done to the lateral ligaments. These 3 ligaments: the anterior talofibular, the calcaneofibular, and the posterior talofibular all limit inversion and stabilize the joint (see the ankle anatomy post under ankle/foot). The severity is “graded” on a 1-3 scale with 1 being the least severe and 3 being the most. Arguably there is a grade 4 (total dislocation of the ankle), though that will not be discussed here. This type of sprain characterized by a slight or mild stretching of the lateral ligaments probably is the most common of all. 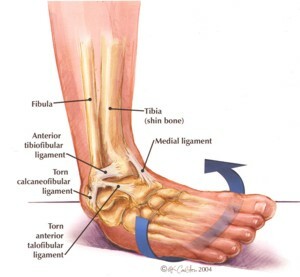 Usually just the anterior talofibular ligament is stretched, though the calcaneofibular ligament can become involved if the amount of inversion and the amount of plantarflexion are just right. Signs and symptoms of a Grade I sprain are mild pain and weakness when stepping or standing on that foot. There will be some tenderness when the outside of the ankle is touched (minimal to moderate). Swelling most likely will occur in the injured area and there can be some bruising around the lateral malleolus. Treatment of this type of sprain constitutes using the RICE method — rest, ice compression and elevation. As soon as the injury occurs, the gymnast should get off his or her feet and ice should be applied to help limit the swelling. Icing should not be any longer than 15 minutes at a time and only once every two hours for at least the first 48 to 72 hours (and continued after activity until the swelling and pain are completely resolved). If possible, the ankle should be elevated above the level of the heart to also help in reducing the inflammation. It is important to also wrap/brace the ankle and minimize weight bearing/walking for the first 7 days (or until there is NO pain with walking). Rehabilitation can begin once the person is pain-free and the swelling has subsided. Rehab can constitute some range of motion exercises several times per day. (see attached rehab for ankle sprains (beginning level). Once the person returns to normal activities (only after all the strength and balance in that ankle has been restored) some bracing or athletic taping is recommended to help provide some support and prevent further injury. 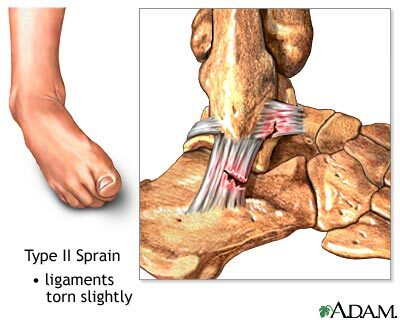 A Grade 2 sprain is characterized by a moderate to severe stretching of the ligaments on the lateral side of the ankle. In some cases. the anterior talofibular ligament might have been torn and almost always, all three ligaments are involved. The signs and symptoms are similar to a Grade I, but the intensity of those symptoms is increased. Standing or walking is more difficult and not tolerated for longer than a few seconds. Swelling most likely will be immediate and there will be enough to mask the shape of the lateral malleolus. The swelling may spread into the top and outside of the foot and there will be bruising (though some people do not show it as clearly). There will be moderate to severe tenderness to palpation and it may extend up into the lateral lower leg as these muscles may also have become strained in an attempt to prevent the inversion. The ankle may also be sore on the medial (inside) as the bones on this side of the joint tend to be compressed and bruised during the inversion motion. In treating a Grade 2 sprain, the RICE method should be followed. For this type of injury, an X-ray exam is strongly recommended to rule out the possibility of a fracture (often the distal fibula breaks off/cracks instead of the ligament tearing). The ankle should be placed in a walking boot and/or crutches should be used until the pain is gone. All training and activity MUST stop as the risk of re-injury and PERMANENT damage is very high. Rehabilitation can begin once pain has subsided and a fracture has been ruled out. A more specialized rehabilitation will be needed, and consultation with a professional is STRONGLY RECOMMENDED. The exercises listed in the attached rehab for ankle sprains (beginning level) is helpful, but will not be enough. After these have been mastered, the gymnast must progress to the intermediate level (also in the ankle/foot & ankle sprains section). With this grade of injury, there is damage to a proprioceptive nerve that runs along each of the ligaments. If balance and proprioception are not adequately retrained, the gymnast will likely become a chronic ankle sprain victim and will have limited ability to progress, and will face permanent joint degeneration. People likely will experience long-term effects from a Grade 2 sprain. This is because ligaments, unlike muscles and bone, do NOT repair. Rather they can “scar down” to mimic their original function. Think of this as a patch/stitch in a torn pair of jeans. It is not as good as the original and ofter does not last as well. The use of a brace or taping will be required when performing any athletic activity for several weeks/months, until it is certain that balance and proprioception are equivalent to the uninjured ankle. A Grade 3 sprain is very uncommon (though not as uncommon in gymnastics) and usually results from a very violent impact or fall. In this sprain, all three ligaments will sustain severe damage. Ligaments likely will be torn and a fracture can also be present. The prioprioceptive nerves that travel with the ligaments will be severely damaged or torn as well. In almost all cases, the inside (medial side of the ankle) will sustain a “compression injury” as the bones will slam together at the joint. This often causes a bone bruise and can cause a compression fracture on that side. 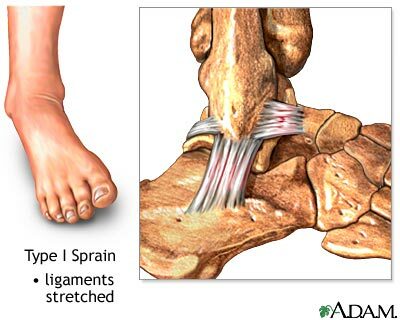 The injured person usually hears or feels a snap or pop on the lateral side of the ankle. Pain and swelling will be severe (into the entire ankle, the lower leg, and top and outside of the foot) and immediate. There will be an obligate loss of motion and the gymnast will not be able to bear weight on that side without considerable difficulty (even though I’d argue most gymnasts are stubborn enough to try). The ankle should be splinted to restrict any movement. Once splinted, ice can be applied intermittently (15 min on, 30 off and repeat until medical attention is available). An X-ray is REQUIRED and a visit to a doctor should occur as soon as possible (yes folks, I’m talking the same day). The use of crutches will be required and under no circumstances should walking be attempted. This can result in further injury/a fall. A doctor will advise you on the best treatment. Rehabilitation will require supervision from a licensed professional. Again, this IS NOT an injury that should be treated at home. With a grade 3 tear, all of the permanent risks from a grade 2 tear are still present, and in some cases even surgery is required to permanently stabilize the ankle joint. This entry was posted in Ankle Sprains, Ankle/Foot on October 11, 2012 by Angie.